There’s quite a few things that make me think ‘summer’, and one delicious thing on that list is kabobs. Seriously, I LOVE a good kabob! 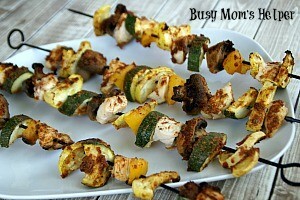 Variety, grilling, and a great fun way to let the kids ‘help’ make their own dinner. Win! I especially love it when I find a delicious marinade for them, and today I’m sharing my absolute favorite: Sundried Tomato Vinaigrette Kabobs! We don’t have a normal grill. I know, that’s insane, but we don’t. We do have a little countertop electric grill I got Hubby our first Christmas together (and it still works…amazing! ), so that’s what we use for now. It’s just not the same, and I’m keeping my fingers crossed that by next summer we can be enjoying a REAL grill for delicious foods like this! The marinade on these kabobs is super easy (add ingredients and blend….can’t get much easier than that!) and is so delicious! You can even use it for a yummy salad dressing, if you want. These kabobs become so juicy and full of flavor when you add the Sundried Tomato Vinaigrette, you’ll be making them again and again! Combine all of the ingredients in a blender and mix until it’s well combined. Choose your items you want for your kabobs. Some ideas may be: Chicken or beef, peppers (green, yellow, red, orange), mushrooms, pineapple, tomatoes, zucchini, squash, onions, etc. Get creative and mix it up! Use a basting brush to spread the Sundried Tomato Vinaigrette all over your food on the kabobs (or before putting them on, doesn’t really matter). Grill (or bake at 350 Degrees F) until meat is fully cooked through. Wow, the holidays are already proving to be crazy busy and full of fun, especially all the get-togethers. I’m loving seeing so many family and friends, and don’t forget the amazing food! Today I’m sharing not one, but Three Delicious Party Food Recipes to help with your festivities! Perhaps you have some long-time friends coming by for a weekend visit, or are hosting a neighborhood wrapping party? I’m getting together with some of my good friends early next week to do some pre-Thanksgiving baking prep, and it’s going to be a blast! Whatever the gathering, it’s so important to have some trusted, amazingly flavorful and quick-to-make recipes on-hand for you to feed the masses, or even just a few good friends! For these delicious party food recipes, swing by Walmart to grab your ingredients. You’ll find the ‘secret’ behind the fabulous flavor in all of these is the Tabasco sauce in Original Red, Jalapeno, and Chipotle! You can find them in the condiments row, near the BBQ sauces. Stock up and try any of these yummy flavors in some of your other holiday party recipes. Sometimes you can play for a bunch of people coming over to your house, other times it may be just a pleasant surprise! Regardless, be prepared to feed whoever something that will be knock-your-socks-off delicious! My entire family loved this Jalapeno Cheesy Bread, and how couldn’t they with all that amazing cheesy-ness?! It has just the perfect amount of savory jalapeno flavor in the bread, and it’s accented by the melted toppings. Serve as a great appetizer, snack or on the side! Preheat oven to 350 Degrees F. Spray or line a bread pan, set aside. Combine the first 8 ingredients together until a nice dough forms. If it’s still really sticky, add a bit more flour. Gently need into a loaf shape, then put into pan. Bake for 40-50 minutes, or until cooked through. In a bowl, mix the colby cheese, green onions and butter together. Cut the top of the bread into a checkered pattern. Stuff the cheese mixture inside all the cut lines into the bread. Cover the entire loaf with foil and bake for another 15 minutes, or until cheese is melted. One of my favorite parts of this Honey Spice Chicken is that it’s totally versatile! Add more or less of the tasty Tabasco sauce so it’s the right amount for your own preference. You can also top with a bit more honey drizzled on the chicken after it’s cooked to adjust the flavor combinations……I’m drooling just thinking about this dish! Preheat oven to 375 Degrees F. Spray or line a baking dish and place the chicken breasts inside with a single layer. In a bowl, combine all of the ingredients (except chicken) until well-mixed. Pour over the chicken breasts. Bake for 35-45 minutes, or until chicken is cooked fully through. If desired, drizzle a bit more honey over the chicken right before serving. 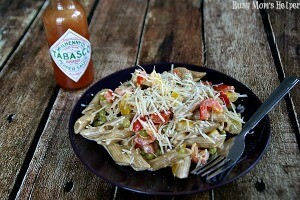 This Chipotle Pasta is now Hubby’s and our exchange students favorite pasta! Full of a rich, creamy sauce and veggies, the mixture of flavors in this recipe can win over any party guest! In a large skillet (or WOK, if you have one), heat the lemon juice, honey and olive oil over medium heat. Add the minced garlic and onion and cook about two minutes, or until starting to lightly brown. Add the peppers and cook until slightly tender. Add the Tabasco, heavy cream, and frozen peas. Heat until peas are warm. Mix in the pasta and continue cooking until everything is heated through. After dishing, top with Parmesan cheese and enjoy! I love Thanksgiving – the family and friends, the baking and roasting, the pies, the potatoes….well, ALL the food 😀 It’s wonderful! My in-laws flew in this past weekend for a few days, so we decided to do a Thanksgiving dinner with them. I had never cooked a turkey before, or done pies really. Mashed potatoes, sure! Rolls or salad? No problem! But the turkey and pies…..ya, new territory. Booyah!!! I’ll be sharing more on my pie lessons in later posts, but today I wanted to share this Sage & Butter Infused Turkey because it turned out Absolutely. Without-a-doubt. AMAZING! You’ll want a turkey roasting bag and a flavor injector, as two not-everyday supplies. Make sure your turkey is thawed ahead of time! Combine all of the ingredients in a saucepan, bringing just to a boil. Remove from heat and allow to cool completely. Find a baking pan that is VERY deep (at least 2 inches) and make a spot of it (placed on top of a baking sheet to catch splashes and keeping in mind the turkey will take up more height) in your fridge – this is easiest to get done now instead of moving stuff while handling the turkey. Not to mention more sanitary. Remove the turkey from it’s package-wrap, and remove all the stuff inside the cavity of the turkey. Rinse the turkey in cold water, then place in the baking pan. Pour the cooled marinade over the turkey, keeping it just a bit lower than the pan top. (this is why it’s on a baking sheet….it may splash a little). Marinate for 12-24 hours, occasionally using a bulb baster to squeeze more of the marinade over the top of the turkey. Preheat oven according to your turkey bag directions. Remove the turkey from the baking pan. If this is the pan you’ll be using to cook the turkey in, wash it thoroughly and set aside. Blend the above ingredients until smooth (may not be perfect, but try). 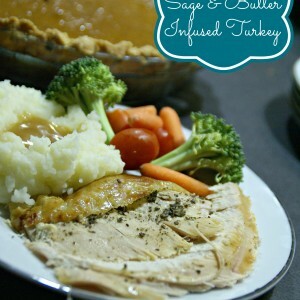 Using a flavor injector, inject the Sage-Butter mixture all over the turkey. Rub any remaining mixture under the skin over the breasts, then all around the turkey so it’s well-saturated. If desired: place produce such as apples, carrots, celery, onions and/or garlic cloves inside the turkey cavity. Follow your turkey bag directions for placing your turkey in the bag (some have you insert flour first to coat the bag interior), and cut slits IF THE BAG DIRECTS YOU TO. Cook as directed, until turkey reaches at least 165 Degrees F in the center. Remove from oven, cut away bag, and allow turkey to sit for 10-15 minutes to allow moisture, juices and flavor to even out. Enjoy your deliciously moist and flavorful turkey!!! Note: If you’re using a roaster instead of an oven, double check that it can handle a turkey bag – I learned this the hard way and within seconds of putting the bag in, the plastic started melting to the sides. NOT FUN! Need some rolls to go along with your meal?